Beautiful and easy to make. 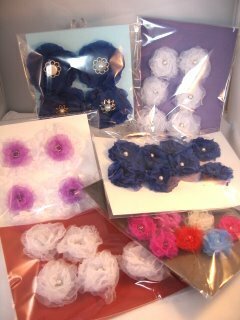 Organza Flowers are a lovely addition to your cards. And they are easy to make for yourself. 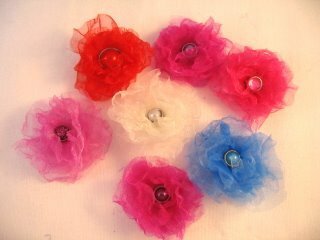 These beatutiful Organza Flowers can be made by you for a fraction of the cost of shop bought ones ... and they are so easy to do. You will need a heat gun for this and a skewer to hold the organza as you work, so as not to burn your fingers.....all will become clear! If you prefer to learn by watching then here is the Video Tutorial. These sheets of Organza where really cheap and there are 20 sheets in this pack. There are several colours in each pack and this one has various shades of pink, lilacs and some white ones. Because the sheets are folded in the pack I ironed mine flat on a very cool setting making sure not to burn the fabric. 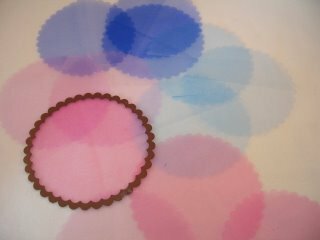 Then using whatever method you have you will need to cut some circles. I used my Spellbinders Nestabilities. I cut out several large circles and I used three layers for each flower, but if you want a fluffier flower then just add more layers. 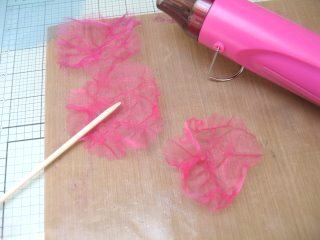 Take your heat gun, and with a BBQ skewer to hold the Organza still, and start to carefully heat the Organza. You will need to work on a heat resistant surface so as not to burn the work top... and a hair dryer will not work!! 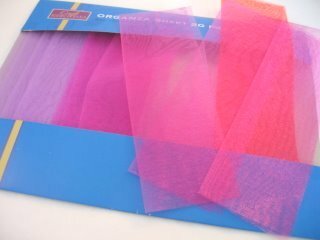 The organza will start to melt and if you use a stabbing action it will only melt in the areas that you aim for. Turn the flower around as you work until you get the desired effect. You really just want to shrivel the organza and not burn it. Trial and error will give you the right result. Repeat this for all your layers. You can fasten the layers together by stitching them with a couple of loops of thread, or use some strong glue. Or do as I have done and use Brads. I put mine through some jewellery spacers and added them to the centre. 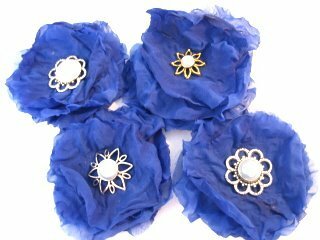 Organza flowers look very delicate so keep your centres in the same style. 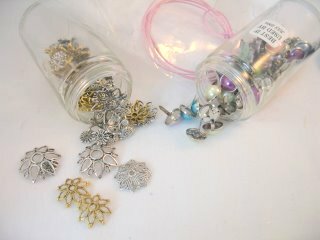 Be adventurous and add the "Bling"
Take another look at whatever you have in your "Stash"
Make them in every colour that you have. Make them larger or smaller by altering the size of the circles. Add some pale Skeleton leaves to the back for a really feminine look. 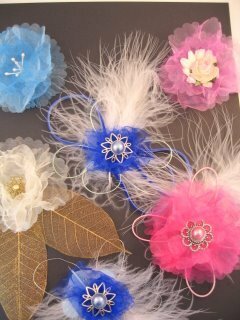 Add feathers and gemstones, or a button centre and more flowers and punched leaves on either side. Make yourself a garden full in one go and store them safely in plastic bags, to keep them clean, until you need them. Or here's another thought....why not make loads and loads .... and sell them. 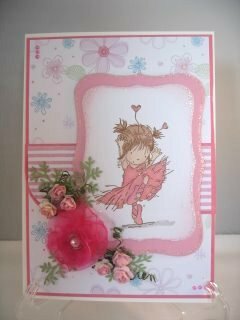 This a very lovely card that will suit girls of all ages. It can be for any occasion but as a Special Birthday it would be ideal. Alter you images by using a different colour scheme, and add the flowers to suit. I am sure you will have some fun making these flowers and adding them to your creations. 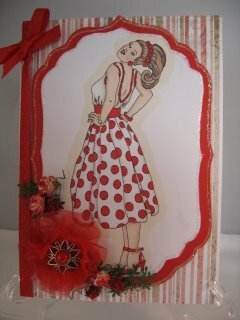 The recipient will love them too, and thank you for all your hard work in making them a really special card.